Vote for Light Rail, Hospitals and Schools. Canberra can have all three. Who are ACT Light Rail? The federal election campaign has been running for months, and the nation heads to the polling booth on July 2nd only a few days away. Many campaign specific commitments have been made across all policy areas. Transport infrastructure and public transport commitments are of great interest to the members of ACT Light Rail, and the existing users of public transport in Canberra. The main focus of ACT Light Rail is public transport infrastructure in the Capital region, and programs and funding to expand the role that better public transport plays in city building, better regional access and community cohesion. Public transport cannot stand alone, it is intrinsically linked to other policy areas such as planning and development. Transport policy needs the same focus. Let us examine each Public Transport or Infrastructure policy or funding commitment and see what Canberra's voters have to choose from. 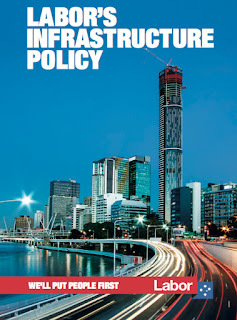 As part of the 100 Positive Policies campaign, the ALP today released the 'Labor Infrastructure Policy'. Public transport is a key area of their policy, and is mentioned on Page 3 ahead of roads. It contains good news for public transport - in every state except for Canberra. This policy offers nothing for public transport in Canberra. ACT Light Rail contacted each of the ALP's federal representatives or Canberra and asked for details about commitments to light rail. A spokesman for Andrew Leigh MP advised that the government commitment of $67 million is still in place and that Canberra would retain that funding if the ALP formed government. The local ALP have invested a great deal of political capital in the Capital Metro Stage One light rail project and this lack of federal Labor support is very concerning. 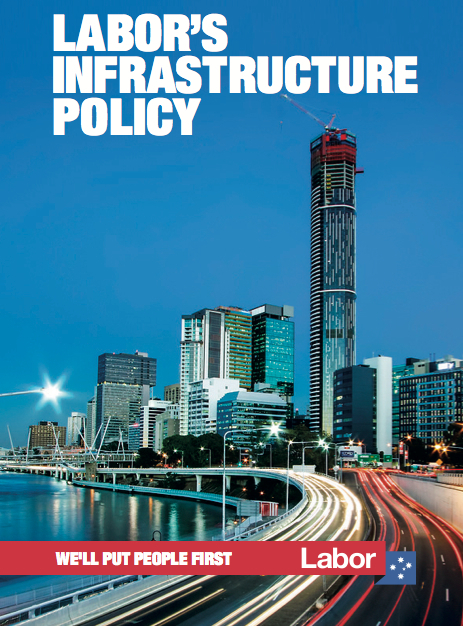 The Liberal Party policy on public transport can be found buried in their infrastructure policy titled 'Building Australia's Infrastructure' found here. Public transport warrants one paragraph in the foreword of a policy that then focusses very much on roads. Although it promotes public transport projects in other states, There is no mention of Canberra specific public transport project in it at all. This is odd, as the federal Liberal government is contributing $60 million dollars from the Asset Recycling incentive scheme, and at the 2016 Budget announced it would increase that by ten percent with an extra $6.6 million dollars. Senator Zed Seselja recently promised to relocate a federal agency to the Gungahlin Town Centre if he was returned. That commitment supports the business case for light rail, as it demonstrates that providing better public transport attracts employment. 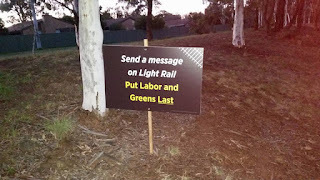 Further adding to the unusual nature of the Liberals federal election campaign is an active effort in their advertising to encourage people who support light rail to vote for the Greens or the Labor Party. The Liberals are telling Canberra voters that if they want light rail, they should vote Greens or Labor at the federal election, and if you oppose public transport then vote Liberal. 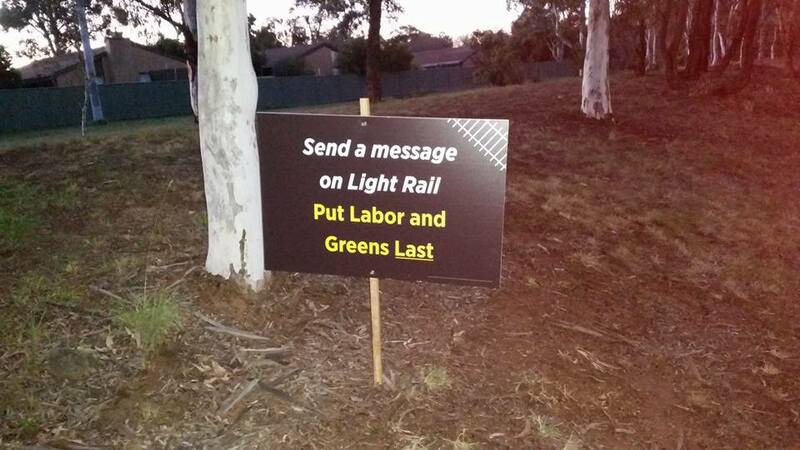 The message being if you want light rail - don't vote Liberal? Not all Canberra Liberals share this view. Robert Gunning, candidate for Fenner, says that "While he acknowledges it is a "possibility" he could pick up votes from light-rail opponents wanting to register their anger with Labor, he doesn't expect it to have a big impact. As the delivery of Capital Metro Stage One is a territory funded and administered program, it is not clear how the light rail project can be influenced by a vote to the Greens or labor instead of the Liberals. It is almost as if the Liberals are in a schizophrenic policy position with the Federal Liberals promoting light rail in Canberra, and the Canberra Liberals campaigning against it. Of the major parties, the Greens offer the most compelling policy for better public transport in the ACT. Their policy 'Building our Green transport future' found here says they will invest $400 million in a second stage of light rail in Canberra. 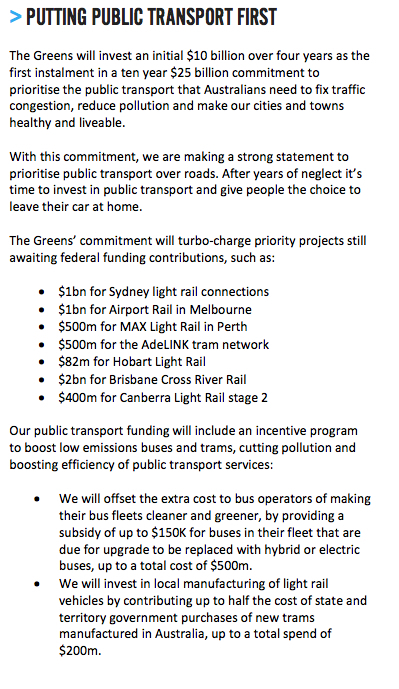 The Greens policy extends beyond light rail stage two construction to promise to invest in and encourage low emission bus fleets and local manufacturing of light rail vehicles. They also commit to making bus priority a feature on main roads. These are sound public transport election commitments. 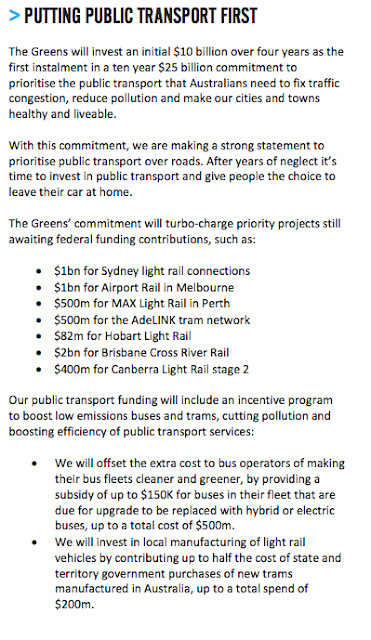 These specific public transport commitments as part of the 2016 federal election are consistent with the Greens Sustainable Planning and Transport policy (found here). The Greens provide the only concrete public transport commitment for Canberra voters from any major party at this federal election. They commit $400 million for light rail stage two in Canberra. 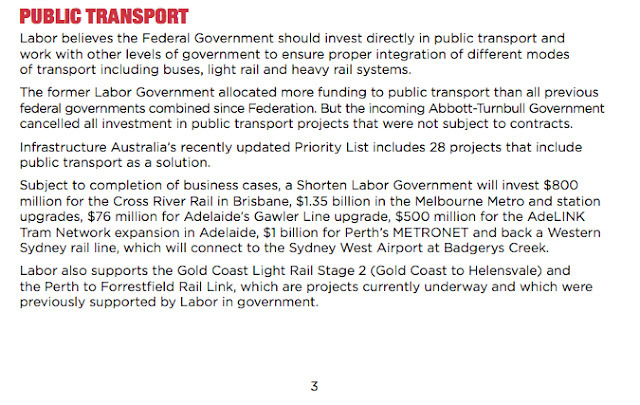 The ALP and Liberals do not make any Canberra specific public transport commitments. The federal Liberal government commitment of $67 million is still in place, and a spokesman for Andrew Leigh MP maintains that the local ALP representatives would retain that funding if the ALP formed government. ACT Light Rail do not suggest or direct that you vote for any specific party or person, the information in this article is to aid your decision making process before you exercise your democratic right at the July 2nd federal election. 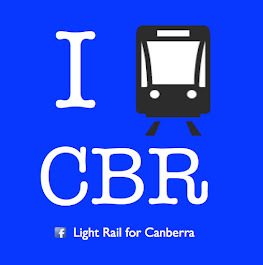 As well as this website, the facebook group 'Light Rail for Canberra' carries frequent updates on Capital Metro and light rail related news. ACT Light Rail are the peak light rail lobby group in the Australian Capital Territory. We have members from Community Councils, all political parties, environmental groups and members of the general public. We believe that light rail offers the best form of mass transit for the ACT, and will serve as the backbone of an integrated public transport system incorporating bus's, park and rides, bicycles and active transport. The ACT Light Rail committee meet regularly to discuss public transport matters of interest and determine our lobbying activities. We hold public meetings on a regular basis. Canberra Light Rail network 2035??? How are we paying for light rail in Canberra? It costs 870 million for 12 kilometers of Light Rail ? Authorised by D.C. Haas on behalf of ACT Light Rail. Picture Window theme. Powered by Blogger.